When the Federal Bureau of Investigation (FBI) concludes its investigation of the Hillary Clinton private email server, the worst damage is not likely to come from the former secretary of state having classified information stored on a private server. Earlier this year the FBI probe expanded into possible violations of public corruption laws resulting from her role as secretary of state and her association with the Clinton Foundation. "The agents are investigating the possible intersection of Clinton Foundation donations, the dispensation of State Department contracts, and whether regular processes were followed," an intelligence source told FOX News. The concern is that Clinton, while secretary of state, gave favorable treatment to governments and businesses that had made large donations to the Clinton Foundation. Hillary Clinton and her representatives have repeatedly denied any such thing took place. But we know the FBI is looking into the matter because it subpoenaed the Clinton Foundation last fall in a quest for documents relating to projects that may have required State Department approval during her tenure as secretary. Should the FBI find a "smoking gun," it would deal the Hillary Clinton presidential campaign a severe blow. Although federal law prohibits foreign governments (or any foreign national) from making political contributions in connection with any election, the Clinton Foundation is a 501(c)(3) public charity. As such, it can legally accept donations from just about anyone. Because it is run by a former U.S. president, Bill Clinton, and a past secretary of state and current presidential candidate, it's not hard to see how many foreign donors would see the Clinton Foundation as a way to buy influence in the American political system. "The word was out to these groups that one of the best ways to gain access and influence with the Clintons was to give to this foundation," Meredith McGehee, policy director at the Campaign Legal Center, told the International Business Times last year. "This shows why having public officials, or even spouses of public officials, connected with these nonprofits is problematic." Several members of the Senate Foreign Relations Committee that confirmed Clinton as secretary of state, including then Sen. John Kerry (D-MA), who was chairman at the time, expressed concern over her connection to the Clinton Foundation. Sen. John Cornyn (R-TX) even wrote Hillary Clinton a letter recommending that the Clinton Foundation refuse "all pledges and contributions from foreign sources" during her time as secretary of state. But the Clinton Foundation relies on large foreign donations to do its work, which includes making AIDS treatments affordable, fighting climate change, and disaster relief. For the most part, the foreign donations continued. 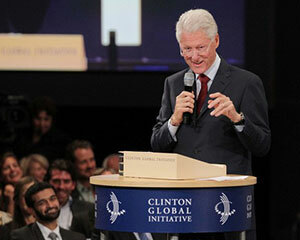 With foreign donations continuing to flow into the Clinton Foundation, apparent conflicts of interest were inevitable. And some things could be dismissed as a coincidence if there weren't so many examples. Take the steep rise in arms deals that occurred for most of the 20 countries that had donated to the Clinton Foundation. Overall this group had $165 billion of arms sales approved by the State Department under Hillary Clinton – nearly double the amount approved in the equivalent period of President George W. Bush's second term. Hillary Clinton's State Department also approved $151 billion worth of Pentagon-brokered deals. 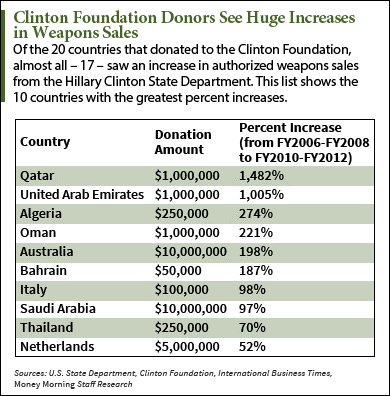 In total, the nations that donated to the Clinton Foundation saw a 143% rise in weapons sales. And two of the countries that got the biggest boosts, Algeria and Qatar, had been criticized for serious human rights violations. Under a 1995 law signed by President Bill Clinton, the State Department is supposed to take such violations into account before approving weapons deals. Meanwhile, several U.S. defense contractors involved in those sales had also donated to the Clinton Foundation. Boeing Corp. (NYSE: BA) led the pack with a $5 million gift, followed by General Electric Co. (NYSE: GE) with $1 million. Honeywell International Inc. (NYSE: HON), Lockheed Martin Corp. (NYSE: LMT), and United Technologies Corp. (NYSE: UTX) also donated to the charity. Foreign groups and individuals also tried to use Clinton Foundation donations as a means to gain influence, or at least access, to Hillary Clinton. Foundation records show that a group known as the "Friends of Saudi Arabia" (FSA) donated between $1 million and $5 million. The FSA had connections to the Saudi ruling family and was created to burnish the kingdom's global image on women's rights. The organization had little interest in philanthropy, so the large donation to the Clinton Foundation was made with one goal in mind. "Our government and our people are for sale, and the Saudis know how to buy," Ali Alyami, executive director of the U.S.-based Center for Democracy and Human Rights in Saudi Arabia, told National Review. Donating to the Clinton Foundation also seems to be a gateway to gaining access to the State Department, and not just for foreign donors. An investigation by Vox last year found that 181 Clinton Foundation donors, most of which are large U.S. corporations, had lobbied the State Department during Hillary Clinton's tenure. So far, there's been no proof Hillary Clinton ever took any specific action as secretary of state as a result of donations to the Clinton Foundation. But the FBI investigation, with access to Hillary Clinton's email exchanges, may have found some. If that's the case, her campaign will be in serious jeopardy. But even if the FBI doesn't come up with damning evidence, the incident tells us something about Hillary Clinton's character as she runs for president in 2016. "These continuing revelations raise a fundamental question of judgment," Lawrence Lessig, the director of Harvard University's Safra Center for Ethics, told International Business Times. "Can it really be that the Clintons didn't recognize the questions these transactions would raise? And if they did, what does that say about their sense of the appropriate relationship between private gain and public good?" The Bottom Line: Dozens of Clinton Foundation donors received favorable treatment from the State Department under Hillary Clinton. While nothing has been proven, the expansion of the FBI's investigation into her email server to include Clinton Foundation conflicts of interest could jeopardize her campaign. In any case, her cavalier attitude toward the issue is troublesome for voters trying to decide if she should be the next president. The Clintons received large sums of money from Qatar and Saudi Arabia. The King of Saudi Arabia and Libyan leader Gaddafi were bitter enemies and Qatar was aiding Libyan rebels. Hillary Clinton lobbied President Obama to bomb Libya, an act of war against a country that did America no harm, when the Clintons received money from countries wanting regime change in Libya. In her book Hillary says she lobbied for arming and training the "moderate Syrian rebels". Qatar and Saudi Arabia wanted to build a gas pipeline across Syria to Eastern Europe and required regime change to get the pipeline built. Therefore Hillary was advocating acts of war against Syria, a country that did America not harm, for the benefit of Qatar and Saudi Arabia who the Clintons received money from. It would seem that Hillary Clinton should be charged for conflicts of interest involving acts of war. Hillary advisor, Huma Abedin, also has connections to Saudi Arabia, another conflict of interest. This traitor should be in prison. To call Hillary Clinton a piece of crap,would be an extreme understatement. Hopefully she will rot in hell,where she belongs. Thanks for listing the many methods of the Clinton's to personally abuse proper laws for their personal financial gains. Please get the proper Agency (s) for determining the laws possibly broken so that proper legal process may be used to get approved prosecution applied for conviction of any and all laws as soon as possible. U all forget the golden rule. The ones with the gold makes the rules. HillBilly will never get charged, she has the gold. Two party system = one coin two sides. Same crap different pocket. Such a tenuous connection won't stick. The FBI did not seek out corruption. They were obligated to investigate because accusations were made. Move along, folks. Nothing new here. Just another dead-end conspiracy theory.